As stated in the AFP Code of Ethical Principles, "The Association of Fundraising Professionals (AFP) exists to foster the development and growth of fundraising professionals and the profession, to promote high ethical standards in the fundraising profession and to preserve and enhance philanthropy and volunteerism." 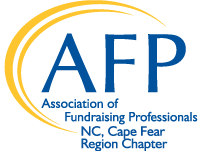 The AFP Cape Fear Region Chapter is committed to these principles and has created a Knowledge Base of senior fundraising professionals. Each of these professionals has at least five years fundraising experience and offer less experienced fundraisers the opportunity to benefit from their advice, counsel and guidance in particular areas of expertise.